We did not design the Massey-Peabody Power Rankings to predict individual games. But the rankings do suggest a pointspread for a game between any pair of teams. With the important caveat that this implied pointspread is generated without any week-specific information (injuries, weather, etc. 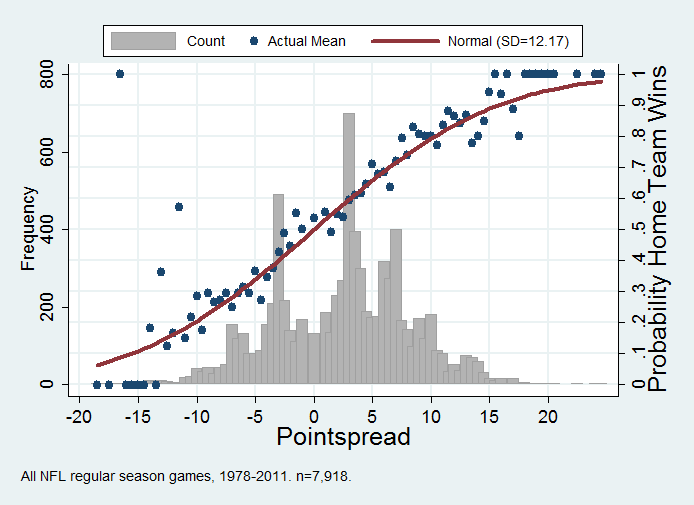 ), we can compare the performance of the pointspread implied by the rankings against publicly available pointspreads. The implied pointspread is the home team’s power ranking (the “points” in the tables posted here) less the visiting team’s power ranking, plus 2.4 points. That is, you need to add the benefit of playing at home to the home team’s rankings. We estimate this advantage to be 2.4 points.